“Brave” is an excellent word to describe the decision by Pixar studios to set this gripping fantasy adventure in Scotland, complete with broad Scottish accents. Kelly Macdonald (Boardwalk Empire) voices impetuous young princess Merida, who scorns the kingdom’s tradition of marrying a lord’s son and yearns to choose her own freedom. However her mother, Queen Elinor (Emma Thompson), demands she comply with the time-honoured rituals to maintain the balance of the kingdom. Desperate to escape marriage to one of the three very undesirable kilt-clad young lordlings on offer, Merida seeks help from a witch (Julie Walters), who lands Merida in hot water by granting her wish. Meanwhile, Merida’s brawny father King Fergus (Billy Connolly) busy keeping the peace between the kingdom’s brawling lords, while keeping a paranoid eye out for the terrifying bear who roams the country and once bit off his leg. With its trademark Pixar sense of humour, this blends old-fashioned storytelling and fresh twists, and is one of the more original animations to emerge in recent years. A further brave choice is placing a girl in the lead role and imbuing her with the feisty courage and deadly archery skills more reminiscent of The Hunger Games’ Katniss Everdeen than any simpering Disney princess. 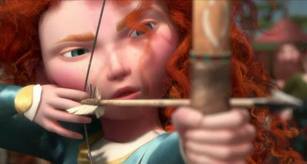 Brave’s male characters are hugely entertaining but very flawed, and the movie’s chief strength is derived from Merida and her mother Elinor, and their complex relationship. The animation is spectacular – the Brave kingdom skilfully straddles realism and fantasy, from the sumptuous landscapes to the glowing blue will-o’-the-wisps that lead Merida to adventure. Merida’s gorgeous flame-red locks are almost a character in their own right – Pixar created a new simulator to create the marvellous depth and movement of the 1500 tumbling fiery strands that shine against the rugged countryside. A cast of skilful voice actors including The Late Late Show‘s Craig Ferguson and Robbie Coltrane keep the tone lively, and while some of the scary scenes may alarm smaller children, this is a clever reimagining of old-fashioned storytelling that will delight both boys and girls.